This module will describe the mechanism of CVD in type 2 DM, and list national guidelines for cardiovascular optimum health in diabetes. It will also present the American Diabetes Association (ADA, 2018) evidence-based prescribing recommendations for the diabetic patient. Advanced atherosclerosis manifests as coronary heart disease, ischemic stroke, peripheral artery disease, and heart failure. It is important to understand the mechanisms, strategies for and challenges with managing heart failure risk in DM, as well as the potential cardiovascular risks and benefits of glucose-lowering drugs, for managing cardiovascular disease in DM. Hyperglycemia can promote atherogenesis and accelerate the progression of atherosclerosis. Acute hyperglycemia can affect endothelial function and reduce nitric oxide (NO) bioavailability while increasing endothelial cell leukocyte adhesion. This processes is mediated in part by increased levels of oxidative stress and inflammation. People with insulin resistance have higher rates of hypertension, dyslipidemia, and impaired glucose tolerance, which contributes to development, progression, and complexity of atherosclerosis (American Diabetes Association, [ADA], 2018). At the cellular layer, impairment of insulin signaling in endothelial cells and macrophages promotes the development and further progression of atherosclerosis. This inflammatory state promotes insulin resistance. In type 2 DM, there is selective impairment of insulin signaling through phosphoinositide 3-kinase /protein kinase B, which mediates the metabolic effects of insulin to maintain normal glucose metabolism, while allowing the extracellular signal-regulated mitogen-activated protein kinase pathway to remain generally intact. Compensatory hyperinsulinemia overstimulates the extracellular signal-regulated mitogen-activated protein kinase pathway, promoting development or progression of atherosclerosis. In addition, insulin-signaling impairment disrupts activation of endothelial NO synthase in endothelial cells and production of NO with resulting endothelial dysfunction. Diabetes mellitus and dyslipidemia commonly occur together. Lipid abnormalities affect 60% to 70% of people with type 2 DM (ADA,2018). Hyperglycemia accelerates atheroma formation in diabetic dyslipidemia. LDL cholesterol particles are more atherogenic in diabetes mellitus in the absence of increased LDL concentration. Diabetic dyslipidemia is also characterized by elevated triglycerides, low high-density lipoprotein (HDL) cholesterol, and higher concentrations of apoB-containing particles. Increased inflammatory markers and mediators are found in obesity, metabolic syndrome, and predict hypertension, type 2 DM and cardiovascular event rates. A marker of inflammation, high-sensitivity C-reactive protein, adds cardiovascular prognostic information. Hyperlipidemia within the atherosclerotic plaque results in recruitment and migration of monocytes and other immune and inflammatory cells into the vascular subendothelial layer. Recruited monocytes differentiate into macrophages or dendritic cells. Activated macrophages express scavenger receptors to facilitate engulfment of both native and oxidized low-density lipoprotein, forming foam cells which, along with other inflammatory cells, increase production of chemokines and cytokines. These mechanisms operate in a feed-forward cycle, promoting atherosclerotic lesion progression within the inflammatory cycle. Excess reactive oxygen species and reactive nitrogen species from mitochondrial injury, abnormal vascular hemodynamics, or hyperglycemia leads to oxidative stress. In addition it causes an increased cell proliferation, migration, endoplasmic reticulum stress, and necrosis. This then manifests as hypertension from vascular endothelial dysfunction, reperfusion injury in patients with underlying occlusive atherosclerosis, and accelerated atherosclerosis. Endothelial dysfunction may be an independent risk marker for cardiovascular events. Dysfunctional endothelium promotes leukocyte and platelet adhesion, thrombosis, and inflammation. Insulin stimulates endothelial NO induced production of NO by endothelial cells. Endothelial function is impaired in both type 1 and type 2 DM. Even short exposure to high glucose concentrations is sufficient to reduce NO bioavailability and endothelial dependent vasodilation. Diabetes self-management education (DSME): Should be patient-centered and help guide clinical decisions. Diabetes self-management support (DSMS): Reduces outcomes and is cost effective with the goal of reimbursement by third party payers. Nutrition Therapy: Aims to support healthy eating patterns and maintain body weight goals. Physical activity: Exercise has been shown to improve blood glucose control, reduce cardiovascular risk factors, contribute to weight loss, and improve well-being. Smoking cessation counseling: Reduces risks for cardiovascular events such as microvascular complications and premature death. Psychological care: Screening for diabetes related depression or anxiety and adherence to treatment plan. In older adults, screening should include cognitive assessment. No more than 2 consecutive days without activity. Chronic kidney disease (CKD): Blood pressure control should be maintained to reduce the risk of kidney disease. When examining cardiovascular risk factor reduction in diabetic patients, there are various approaches using a variety of statins and other lipid-lowering agents, antihypertensive therapies, and antihyperglycemic treatment strategies drugs or approaches. These drugs are prescribed for the treatment of hyperlipidemias and work by decreasing production of lipoprotein or cholesterol, increasing degradation of a lipoprotein, or increasing the removal of cholesterol from the body. Statins are the first-line treatment to lower LDL-C in patients with hypercholesterolemia. Some high cardiovascular risk patients may have inadequate responses to statin therapy or are intolerant to statins, and may need additional and/or alternative non-statin therapies to further reduce their LDL-C levels (Chaudhary, Shah & Sumner 2017). Monoclonal antibodies that inhibit proprotein convertase subtilisin/kexin type 9 (PCSK9), a key regulator of circulating LDL-C levels is non-statin therapeutic options for the management of hypercholesterolemia. They target and inactivate a specific protein in the liver. Reducing this protein, called proprotein convertase subtilisin kexin 9, dramatically lowers the amount of harmful LDL cholesterol circulating in the bloodstream. This class is reserved for patients whose cholesterol is not controlled with diet and statin treatment. The American College of Cardiology (ACC), 2018 pathway suggests non-statins to further decrease risk when LDC-C is not reduced by at least 50% despite maximal statin use. Currently two drugs (alirocumab and evolocumab) are FDA approved. There are others currently in clinical trials. There is a wide range of antihypertensive drugs aimed at lowering blood pressure. With diabetic patients, combination therapy is commonly required to lower BP. There are a variety of combinations and therapies. Diabetic patients with hypertension are also more resistant to antihypertensive treatment, indicating that use of combination treatment should be the first-line treatment in diabetic patients. A RAS blocker (Inhibitors of the renin-angiotensin system) combined with a thiazide diuretic is the cornerstone of treatment for patients with diabetes and hypertension. β-blockers should not be prescribed as a first line therapy due to the risk of new-onset diabetes; however, they may be used in combination therapy (ACC,2018). Aspirin 75mg- 162 mg/day decreased thromboxane and inhibits COX-1. The ADA (2018) and the ACC (2018) recommend low dose aspirin for type l or ll diabetic patients as primary prevention for patients with no previous history of vascular disease who are at increased risk for cardiovascular events. In addition, the ADA (2018) found that low dose aspirin reduced myocardial infarction risks in diabetic patients. Aspirin is the foundation for antiplatelet therapy, used for the primary and secondary prevention of coronary and cerebrovascular events. The ADA (2018), recommends Aspirin in those with a history of atherosclerotic CV disease, but clopidogrel 75 mg/ day can be used for those with an aspirin allergy. HbA1c likely causes coronary artery disease (CAD), but the underlying mechanisms are not yet clear, according to a recent study (ADA, 2018). The Food and Drug Administration (ADA,2018) recently approved a change in the prescribing information for people with Type 2 diabetes and pre-existing heart disease. Jardiance ( empagliflozin) and Victoza (liraglutide), indicating they can be used to reduce the risk of cardiovascular disease in this group. Empagliflozin received an indication to only reduce cardiac death. Liraglutide received a broader indication, including reduction of heart attack, stroke, and death. The appropriate treatment strategy in patients with type 2 diabetes at high CV risk, not only the glucose-lowering effects, but also the overall benefits and risks of CV disease should be taken into consideration. Dipeptidyl peptidase 4 (DPP-4) inhibitors prolong the activity of glucagon-like-peptide 1 (GLP1), the gastric-inhibitory-peptide, by preventing their breakdown. The agents in this class have slight HbA1C reductions, but their benefit is that they do not cause hypoglycemia or weight gain. Three DPP4 inhibitors, namely saxaglipitin, aloglipitin, and sitaglipitin have been tested in a current study and none were found to increase adverse CV events, CV mortality, or all-cause mortality. Sodium-glucose transporter 2 (SGLT inhibitors’) CV benefits occur through osmotic diuresis, reduction in weight, arterial stiffness, left ventricular afterload, and overall modulation of the cardio-axis (ADA,2018). Work by copying, or mimicking, the functions of the natural incretin (hormones that help lower post-meal blood sugar levels). These functions include: Stimulating the release of insulin by the pancreas after eating, even before blood sugars start to rise. 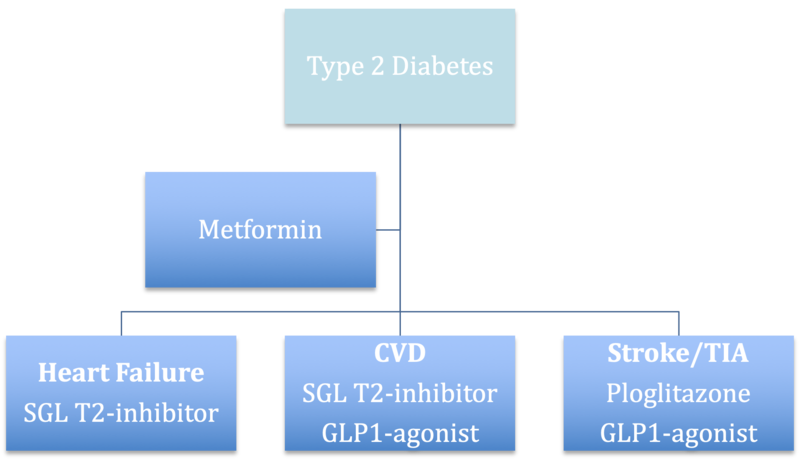 *First line drug in the treatment of type 2 diabetes. In asymptomatic patients, routine screening for coronary artery disease is not recommended as long as risk factors are treated (grade A recommendation). Ms. Garcia is a 68-year-old woman who has had type 2 DM for 15 years, which she manages with diet, exercise and metformin. Her BMI is 30. She’s a nonsmoker. She was hospitalized nine months ago for heart failure, following a myocardial infarction. Her HbA1c is 9.6% and LDL-C is 150 mg/dL with a blood pressure of 140/82. Other medications include atorvastatin 80mg and daily aspirin. What other information about Ms. Garcia would be helpful in determining a plan for reducing the risks for cardiovascular disease? Ensure multiple risk factor control: Referral to a lifestyle interventionist to assist with diet and physical activity recommendations. These changes may help to lower weight to a healthy BMI and help to reduce her blood pressure by following the DASH diet and engaging in at least 30-40 minutes of moderate activity every week (ADA,2018). Ms. Garcia’s dose of atorvastatin is maximized, yet her LDL-C remains at 150 mg/dL. Current recommendations from the American College of Cardiology (ACC, 2018) recommend adding a second nonstatin to further reduce her cardiovascular risk. The ADA (2018) recommends that prescribers considering adding a second agent of cardiovascular benefit for patients when they have concomitant diabetes and cardiovascular disease. For those with a HbA1c ≥ 9%, the GLP-1 agonist is indicated. A SGLT-2 inhibitor may also be beneficial in further reducing the risk of heart failure. Access Medicine. Lipid-Lowering Drugs. (2018). The American College of Cardiology. Endocrinology Advisor. Relationship between Hga1c and Coronary Artery Disease. (2018). National Institue of Diabetes, Digestive and Kidney Disease. (2018).